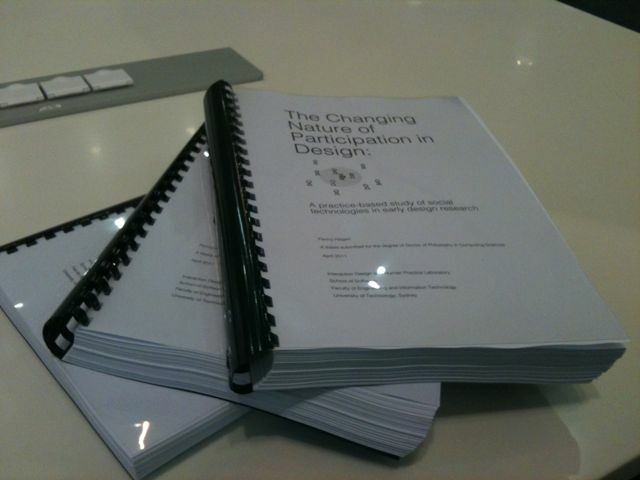 I can not express how pleased I am to have finally submitted my PhD thesis for examination. There are so many friends, family members, colleagues, participants, clients, researchers, tweeps, acquaintances and strangers whose words, thoughts, support and understanding were critical in the development (and most importantly the completion) of the thesis. To all of you, thank you so much. It really is finished this time. I’ll be posting a link to the full Pdf shortly. [Edit – here is the link to download the thesis] Please find the in brief version (abstract) below. Social technologies put a new emphasis on participation. This thesis investigates the impact of social technologies on how we enable, conceive and manage participation in early design. The research questions in this thesis address how, and in what ways, using social technologies as design tools can support participation in the early stages of design, and how using such tools creates new opportunities for participation in early design when social technologies themselves are the subject of design. It develops and presents concepts and strategies that account for the sharable, social and participatory nature of social technologies and encourages designers to reconsider how notions of participation are currently embedded and framed within existing design methods and models. The questions are explored through a practice-based investigation into the use of social technologies as self-reporting tools. Over the course of two field studies a self-reporting method, Mobile Diaries, was iteratively designed, evaluated and implemented in a specific commercial design context. The analysis demonstrated that using social technologies as design tools enhances the capacity for self-reporting to enable participants to contribute to design from the context of their own lives. This greater integration between the activities of research and everyday life blurs some traditional design research boundaries, with ethical and methodological implications for which we are only beginning to account. In addition, when social technologies are the subject of design, using social technologies as design tools creates an experiential connection between the activities of researching, designing and using. This creates new opportunities for participation through use early in the design process that blur traditional boundaries between the activities of research, design and use. Barriers to embracing these opportunities in commercial contexts include the assumption that the activities of design and use progress consecutively and the value of early participation in design is largely embodied in the tangible outputs of design research. 3. Strategies to articulate and support experiences and outcomes important to the early design of social technologies in community settings, through the use of social technologies themselves. 4. It is an example of how practice-based design research can be conducted in a commercial context in ways valuable to both practice and research domains. FYI: some of this research is already available through published papers and articles.